EasyTurf is scheduled to showcase their industry leading synthetic pet turf at the Orange County Home and Garden Show Oct. 4,5. EasyTurf is scheduled to showcase their industry leading synthetic pet turf at the Orange County Home and Garden Show Oct. 4, 5. The show will be held at the Orange County Fair and Event Center and feature hundreds of exhibits, free do-it-yourself seminars, home improvement professionals, and highly qualified exhibitors like EasyTurf. EasyTurf staff will set up an interactive display, giving the public an opportunity to see and feel the industry leading synthetic turf. A drainage tank will also demonstrate the ingenious engineering of EasyTurf’s proprietary MaxxFlo backing, an especially important point for pet owners. “Our commitment to excellence continues to attract homeowners and commercial businesses searching for functional, aesthetic improvements,” said Hartman. 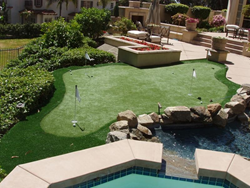 For more information about the synthetic turf industry leader, visit http://www.easyturf.com.